Kennebunkport, Maine is a quintessential seaside town in southern Maine. Thousands of tourists flock to the small coastal town to eat lobster and get a glimpse of the Bush family. 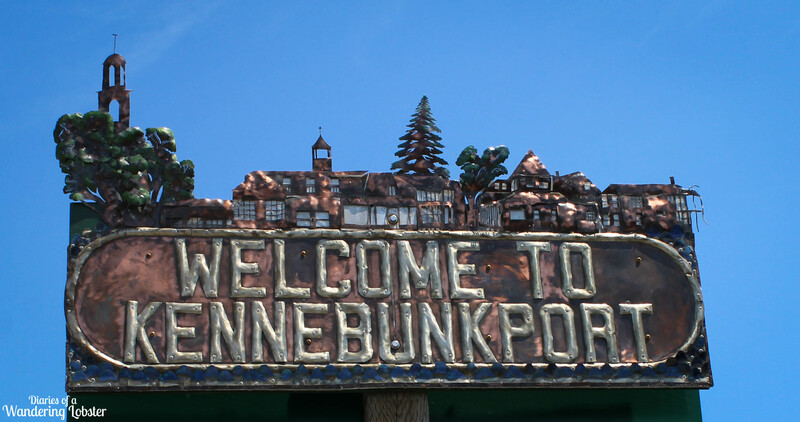 After all, Kennebunkport is only about 90 minutes north of Boston and 30 minutes south of Portland. The town is more than just Presidential sightings and lobster though. There is plenty to do in both Kennebunkport and its sister town, Kennebunk, to meet the whole family’s interests. 1. 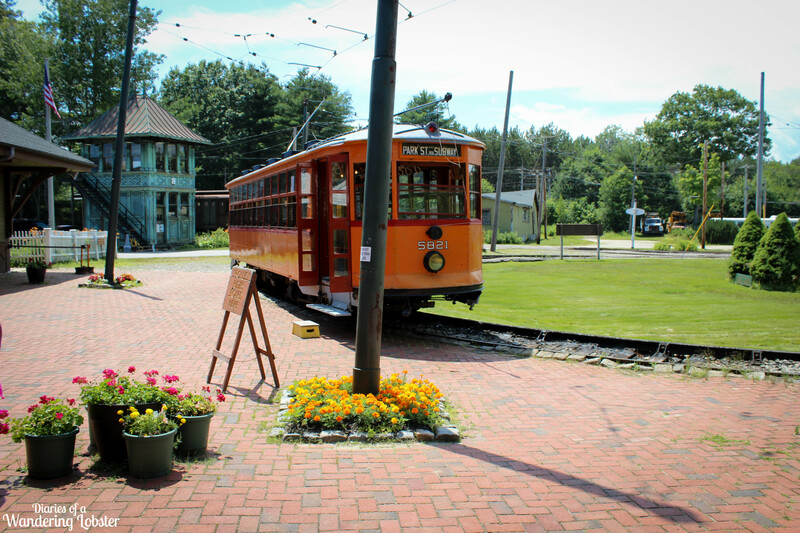 Seashore Trolley Museum – The Seashore Trolley Museum is located just a few miles outside of Dock Square on Log Cabin Road. The museum contains over 250 transit vehicles, mostly trolleys from all over the world. It was started in 1939 and has since grown exponentially over the decades with the help of hundreds of enthusiast volunteers. As you walk through the main gate, you are instantly brought back in time where railways dominated transportation around the world. One can step aboard trolley cars from Boston to London to Japan. For $10 an adult and $7.50 a child, it’s a great way to explore history and ride a trolley! 2. Ocean Avenue – Ocean Avenue is the main seaside road that winds around the coast from Dock Square in Kennebunkport up to Arundel. Grab your jogging shoes or a bike to exercise with a view! Of course, you can drive your car down the road, but to really take it the beautiful summer cottages and the most famous “cottage” on Walker’s Point, it’s best to explore on foot as you’ll want to snap some pictures of the ocean waves crashing on the rocks. 3. Walker’s Point – Any trip to Kennebunkport isn’t complete without a glimpse of former President George H. W. Bush’s family compound on Walker’s Point. While you can’t just walk up to the front door without being jumped by multiple secret service agents, you can stop along Ocean Avenue and snap some photos on the cliffs of the home. If you’re lucky, maybe you’ll see the Bush family! 4. Saint Ann’s Church – St. Ann’s Episcopal Church is a historical stone church located off of Ocean Ave. It’s about halfway between town and Walker’s Point. The church was built in 1887 to serve the communities of Kennebunkport, Kennebunk, and Cape Porpoise. The church is constructed from large sea-washed stones, pine beams, and slate floors. There are 25 beautiful stain-glass windows, many of which are from the turn-of-the-century. The church is open from mid-June through Labor Day for visitors. You don’t have to be a religious person to enjoy the church as its history and architectural beauty are worth the stop. 6. The Beaches – There are several great beaches in the area for your swimming and tanning pleasure. Just make sure you wear plenty of sunscreen! Kennebunk Beach is a great sandy beach to hit at low tide for the whole family. Just beware that parking can be limited along the street. Gooch’s Beach is another hot spot and is dog-friendly during the early morning and evening hours. It’s best at low tide and parking is $20 for non-residents. 7. Saint Anthony’s Monastery – Located across the river in Kennebunk, the Monastery grounds are open to the public year around. The Monastery operates a guesthouse/hotel on the grounds that has favorable reviews. As a functional Monastery, there is an open air chapel on the grounds and numerous walking trails along the Kennebunk River to enjoy the peace and tranquility of nature. 8. 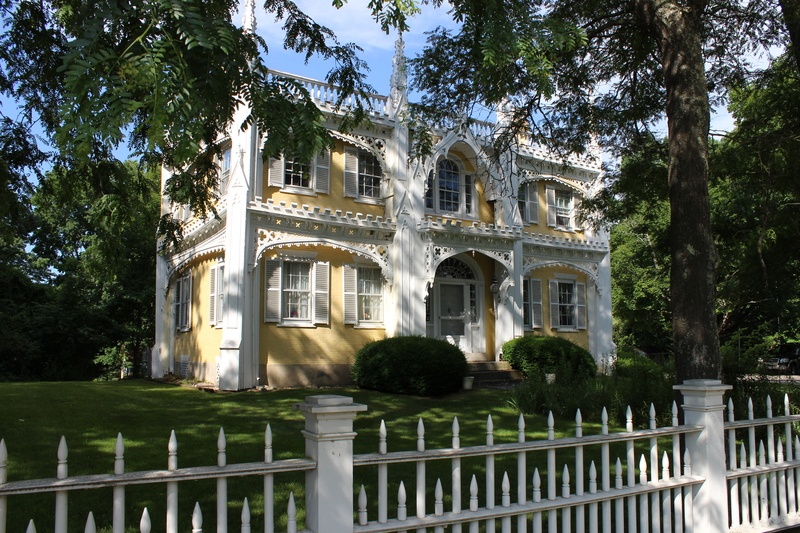 The Wedding Cake House – Located at 104 Summer Street in Kennebunk, the Wedding Cake House is claimed to be the most photographed house in Maine. Who doesn’t want to take a picture of a house that looks like a wedding cake? Now only if it was edible…. oh, wait this is not the story of Hansel and Gretel. Unfortunately, there are no tours offered at the house as it is a private residential home, but you can stop along Maine 9A and snap a few photos of this unique home. 9. Picnic in the Park – Grab some food at any of the local eateries around Dock Square and head to the River Green Park to enjoy a picnic on the grass. The small park is quiet and kid friendly. The little flower garden is perfect place to sit a read a book for a couple of hours or just people watch. PS – There is plenty of free parking on the side streets in this area. 10. Eat Lobster – Obviously, if you visit Maine you need to eat the red crustacean that we’re so famous for! 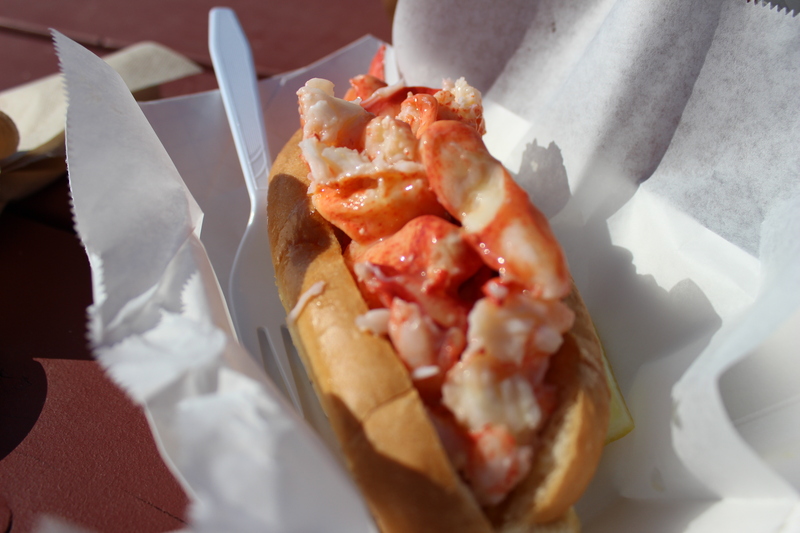 Whether it’s a whole lobster or a famous lobster roll at the local seafood shack. You can’t go wrong. Follow up your lobster feast with a cone of the world-famous Rococo Artisan Ice Cream! Kennebunkport, Maine offers a wide range of activities to do during the summer months. Not just the things listed above. You can enjoy whale watching, kayaking the Kennebunk River, or sailing the great Atlantic Ocean. If adventure on the sea isn’t you’re thing, then explore the art galleries while nibbing on homemade fudge from The Candy Man. Visiting Kennebunkport during fall, winter, or spring? Check the Kennebunkport Business Associate website HERE. Have you been to Kennebunkport? What was your favorite activity? Back when I lived in NY, I always wanted to take a trip to Maine. It just seems so cute and beautiful, and your pictures certainly reflect that. I actually considered a few colleges in the state, but it ended up being too expensive. One of my former coworkers is actually up there for a visit this week, as she hopes to move there. I totally want a house that looks like a wedding cake, by the way. Adorable.